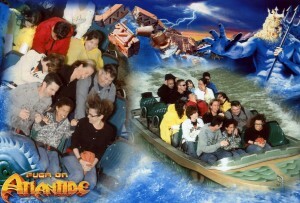 Well, Cam and Melissa and Noah went to Gardaland yesterday. Poor Cam, he was told that he could either take his family and himself to this Italian amusement park or go to work. Decisions, decisions, decisions. I hope he’s not still wondering if he made the right one. In this picture he and Noah, MY NEPHEW, and Melissa, the other best part of my brother, are in the front row of the boat and his boss, Roy, Roy’s wife, Jo and their son, Garrett are behind them. I hope poor Garrett doesn’t grow up to be as evil as his father…. forcing innocent families to go on fun-loving field trips to amusement parks in Italy… When they could have been at work all day. What is this world coming to? I hope the whole squadron had a wonderful time! Now the really interesting part. Will the picture load the way I think it will? If not, I will call my brother and get him to post it for me. Obviously it is necessary to call the brother. I don’t see any picture. I did! Be patient. He’s gonna put it up here! The pictue is fantastic, I showed it to Triston a while ago, because he was asking about Noah.. He was very impressed.. Wanted to see more pictures!